Ricardo X. Ramirez was born in Tennessee November 24, 1968. He graduated from Zapata High School in 1986 and went on to Texas A & M and graduated in 1991 with a degree in Agricultural Economics. He is married to Erica Ramirez, have four children, Hugo, Kaitlyn, Kristyn and Kathryn and two grandchildren, Andre and Stephen. Mr. Ramirez has a strong belief in giving back to the community. He currently serves on the Appraisal District Board, Region One ESC Board, Zapata Boys and Girls Club Board of Directors and is actively involved in numerous fundraising events. 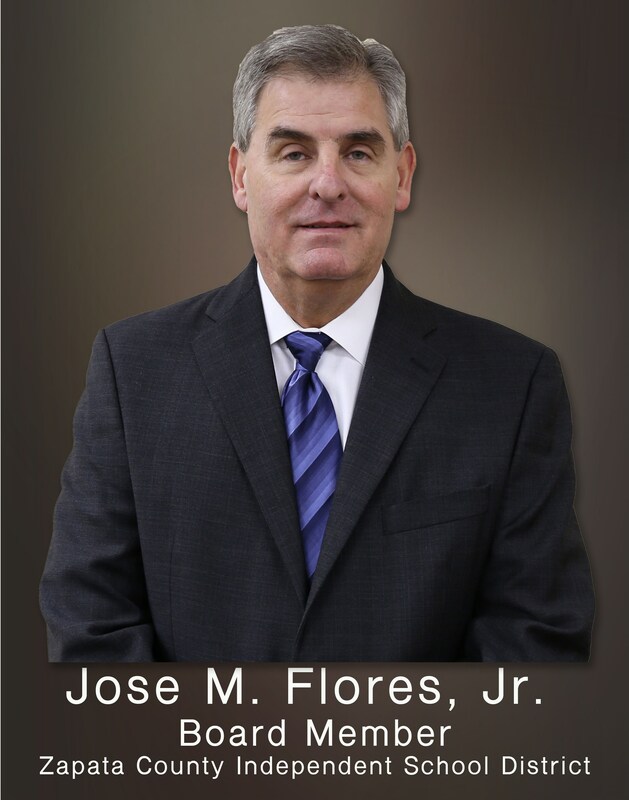 He is the CEO and President of International Bank of Commerce-Zapata and oversees 10 banks in the South Texas Area. Mr. Ramirez has served on the board for 19 years and has thoroughly enjoyed ensuring that all the children of Zapata County have a quality education. 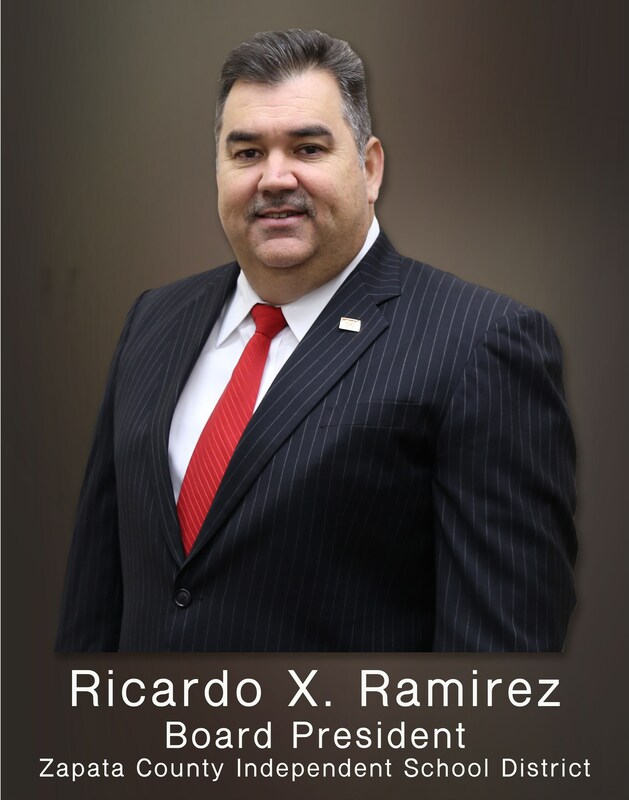 Ricardo is a devoted family man, an avid hunter and enjoys spending time with his children and grandchildren. Mr. Gonzalez is a proud graduate of Zapata High School, and lifelong resident. He is married to Raquel Caballero Gonzalez and has 4 children, Gabriela, Andrea, Victoria and Manuel, III, all products of Zapata County public schools. Mr. Gonzalez is the son of the late Constable Manuel Gonzalez, an educator for our community, and Maria Elena Gonzalez, a retired self-employed business woman, who sacrificed to put all 5 of her children through college. Mr. Gonzalez is a graduate of Texas A&M University in College Station, TX. He has owned and managed Premier Civil Engineering, LLC with partner Eduardo Javier Gutierrez since 2004. As a member of the school board, his main objective is to focus on providing the teachers with the best resources available so that students will have the highest academic achievement. Mr. Gonzalez believes communication is the key to any successful leadership and takes pride in his ability to communicate with everyone and to treat everyone with kindness, equality, and respect. "If we focus on positive change, we can only bring new hope and fairness for all. 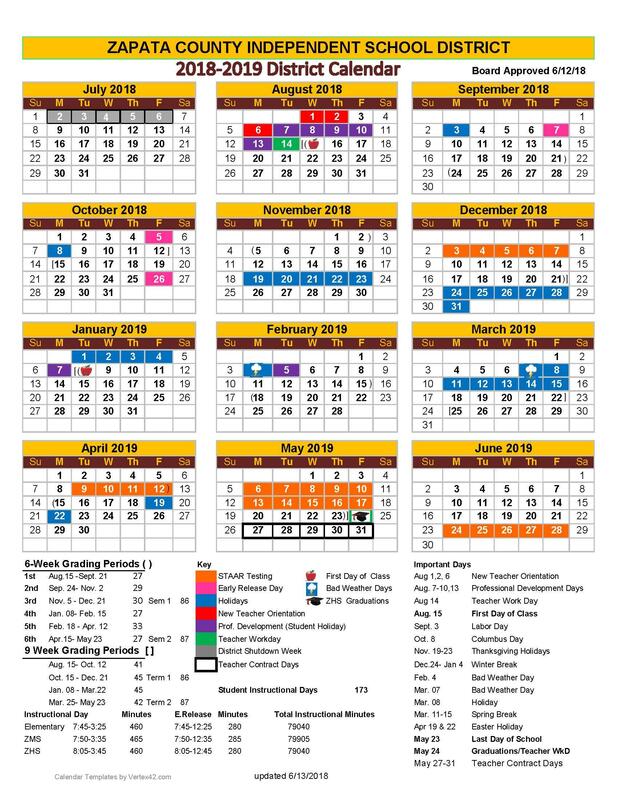 The most important reason for serving the community as a board member will always be to provide the best possible education for our children who are the future of this great community." Mrs. Martinez is a proud 1973 graduate of Zapata High School. Together with her husband of nearly 43 years, they raised three children and enjoy every minute with their nine grandchildren. Mrs. Martinez's love for learning ranges from her profession as a director of Zapata Head Start to being an active ZCISD School Board member for over 20 years. Mrs. Martinez is committed to the belief that children come first. She feels her role as a ZCISD School Board member is to ensure teachers and students have the necessary materials, training and resources to encourage each to strive for personal excellence. Mr. Flores is a lifelong resident of Zapata County and retired from education in 2012 after 35 years with the Zapata County Independent School District. 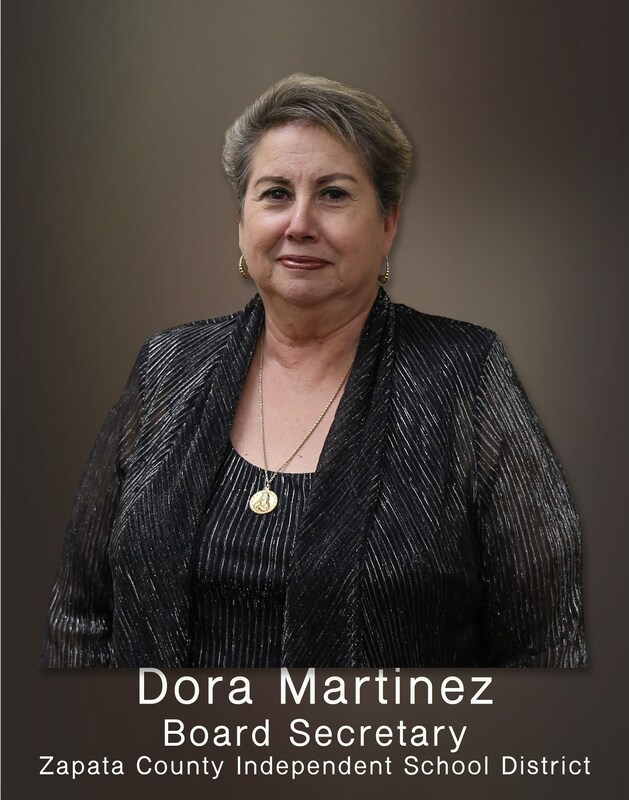 He is married to Dora A. Flores, who retired from Zapata Co. ISD after 25 years of service and has two daughters who are products of Zapata County schools. Both Delinda and Delissa are accountants for Webb County. Mr. Flores began his career as a math teacher and coach for 14 years, an assistant principal at the high school for 6 years, a principal at North Elementary for 4 years, principal at Zapata High School for 5 years, Federal Programs Director for 2 years, and returned as the principal of the high school for the last 4 years of his career. "The future of Zapata County relies on the success of its children, and it is our responsibility to make sure they have the best teachers in the classroom as well as the necessary tools to achieve their goals. My experience allows me to work with children, parents, teachers, and administrators to improve communication and build effective relationships where people are treated with dignity and respect. I support policies that demonstrate fiscal responsibility, invest in technology and academics, promote student achievement, support extra-curricular activities, and employ the most highly qualified staff." Diego Gonzalez was elected to the Zapata County ISD School Board nearly 10 years ago. As a lifelong resident of Zapata County, Diego and his wife of 28 years, Patricia, have eight children and 19 grandchildren. Gonzalez graduated from Zapata High School in 1974 and still stands true to his alma mater. His active role as a school board member is a testament to his pride in the community. Mr. Gonzalez has worked for nearly all of his life, starting at the very early age of 15. 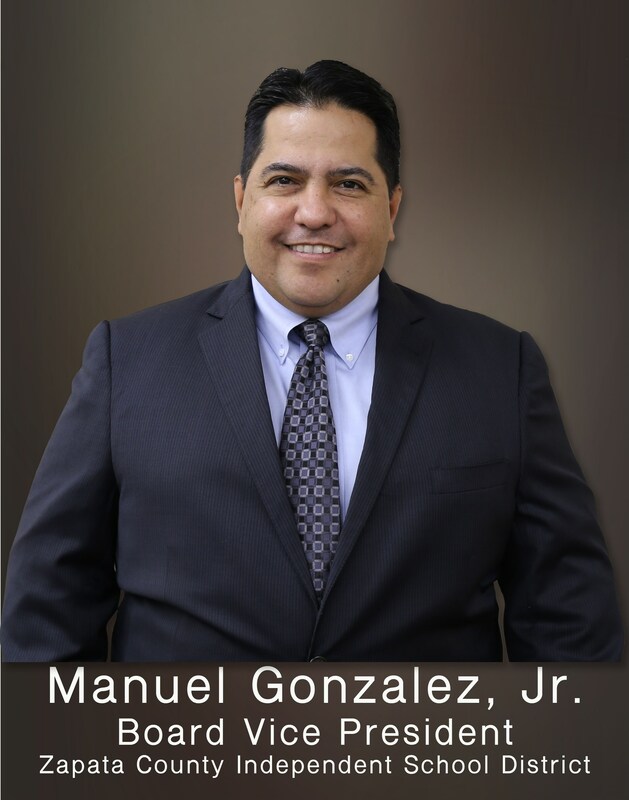 Mr. Gonzalez has over 18 years of work experience in the oil field industry and 15 years of work experience in banking. Among his numerous accomplishments, Mr. Gonzalez is a proud cancer survivor. He tunnels his strength and perseverance to public service. Diego always faces difficulty and challenges with a positive attitude. Gonzalez inspires to continue to help support the district by making good, solid decisions and policies to ensure quality education for all students. Mr. Ramirez is a lifelong resident of Zapata County, and is married to Noemi Ramirez, a school counselor at Fidel and Andrea R. Villarreal Elementary. Mr. Ramirez has three children, Adrianna, an elementary teacher and Texas A&M graduate, Jose IV, a sophomore at TAMIU, and Amanda, a senior at Zapata High School. 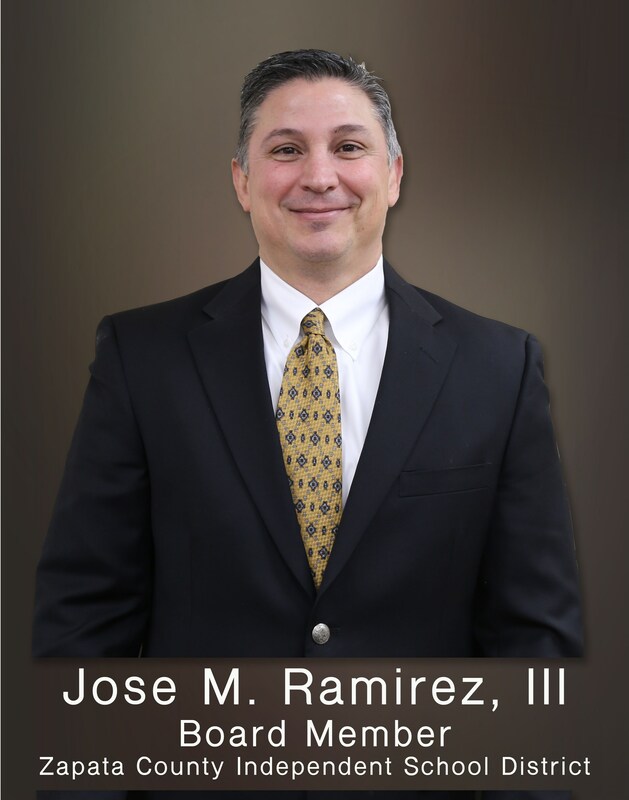 Mr. Ramirez is a 1986 graduate of Zapata High School, and a 1990 college graduate of Texas A&M University in College Station, where he received a Finance degree. “Pepe” has been employed at Zapata National Bank for over 26 years, and currently serves as the bank’s President and CEO. As a member of Zapata County ISD’s School Board, Mr. Ramirez believes that the students of our District should always be our number one priority. “I am committed to all students and will, to the best of my ability, voice the importance of each of their educational progress and ensure they receive an education that will have them college ready”, stated Mr. Ramirez. As a strong supporter of extracurricular activities, he believes it is critically important that successful and winning programs lead to successful and motivated schools. Mr. Trevino is a lifelong resident of Zapata County. 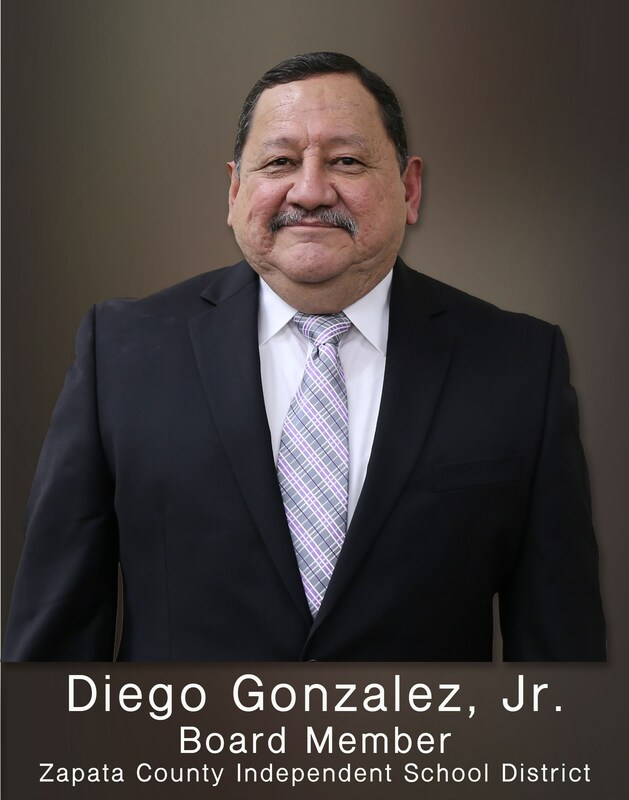 He graduated from Zapata High School in 1969 and continued his education by earning his Bachelor's Degree in 1972, Master's Degree in 1975, Mid-Management Administrator Certificate in 1978 and a Superintendent Certification in 1986. His experiences include having worked for 29 years as an Elem. Teacher, Curriculum Writer, Elementary Principal, and Special Education Director in Zapata County ISD. 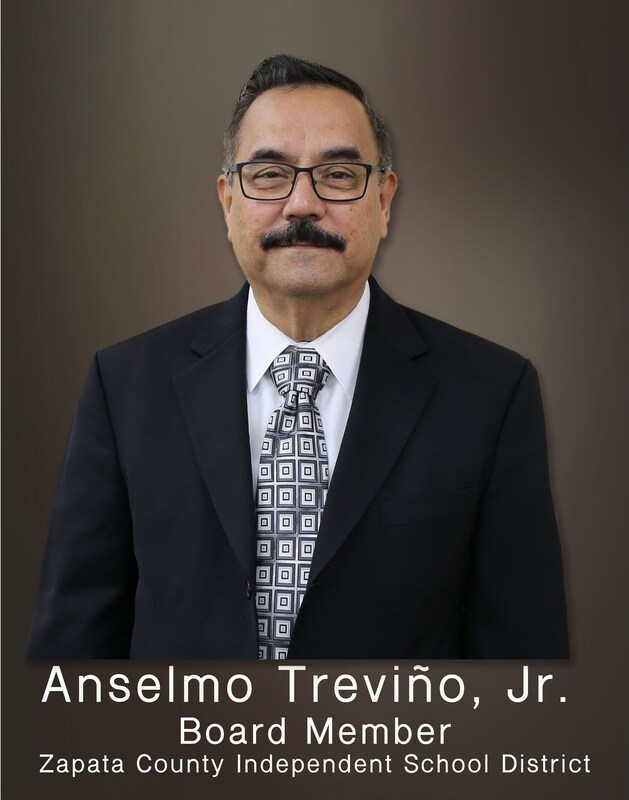 Among his numerous educational achievements, Mr. Trevino is an active member of the community. Currently, he is a board member of the Zapata County Museum of History and of the Nuevo Santander Genealogical Society. He has served for 30 years as a director of Zapata National Bank. Mr. Trevino is also a Licensed Insurance Agent. Anselmo and his wife, Rosa Nelia, have been married for 42 years. They had three children: Angela Nelia T. Ramirez, Anselmo III and Andrew Joseph Trevino.